Recipe by Guest Blogger Hannah Kaminsky from Bitter Sweet. Makes 14 – 20 Servings. Preheat your oven to 350 degrees, and lightly grease and flour two 9-inch round cake pans. In a large bowl, sift together the flour, cornmeal, sugar, baking powder and soda, salt, and pepper. Whisk lightly to aerate and combine. Pull out your blender or food processor and place the shucked corn kernels in the canister, along with the coconut milk. Blend on high speed, pausing to scrape down the sides as needed, until the corn is completely pureed and perfectly smooth. Add in the non-dairy milk, vinegar, and oil, and pulse to combine. Pour the wet ingredients into the bowl of dry, mixing with a wide spatula just until the batter comes together. It’s fine to leave a few lumps, as long as there are no big pockets of flour remaining. Divide the resulting batter equally between your prepared cake pans, smoothing out the tops with your spatula before sliding them onto the middle rack in your oven. Bake for 30 to 35 minutes, until golden brown around the edges and a toothpick inserted in the centers cake comes out clean. Meanwhile, prepare the filling by combining the frozen Wild Blueberries, sugar, and lemon juice in small saucepan over medium heat. 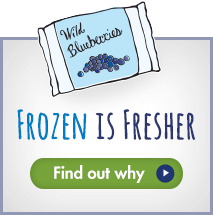 Allow the frozen Wild Blueberries to thaw and become juicy, bringing the liquid to boil and stirring until the sugar dissolves. 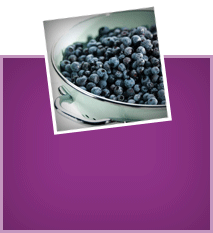 Boil steadily until the frozen Wild Blueberries have burst and the mixture is thickened, stirring occasionally and mashing the Wild Blueberries roughly with fork, for about 8 – 10 minutes. Remove from the heat, cool, and chill thoroughly before using; at least 30 minutes. 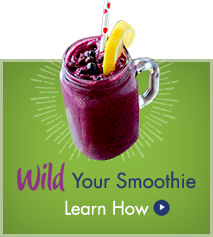 For the frosting, toss the frozen Wild Blueberries into your blender or food processor and thoroughly puree. Pass the smooth puree through a fine mesh strainer to catch any remaining pieces, pressing hard to extract all of the liquid, and discard the solids. Measure the resulting seedless puree and add enough non-dairy milk to equal 1 cup total. Place the mixture in a medium saucepan, along with the cornstarch and salt. Whisk vigorously to dissipate any lumps of starch before turning on the heat to medium. Continue whisking gently until the mixture thickens and large bubbles begin to break on the surface. This won’t take very long since it’s a small amount of liquid, so don’t walk away! It takes mere seconds for it to scorch miserably on the bottom. Let cool to room temperature, and then place a piece of plastic wrap directly on the surface. Move the whole pot into your fridge to chill thoroughly- This should take about 1 – 2 hours. Once the thickened Wild Blueberry mixture is completely chilled, place the margarine and sugar (yes, granulated! Do not try using confectioner’s here) in the bowl of your stand mixer, and cream together until homogenous. Don’t rush this step, as thorough creaming ensures that the sugar granules actually dissolve into the frosting; Allow a solid 3 – 5 minutes here, depending on how cold the margarine is. Finally, add the cooled Wild Blueberry mix into the bowl, along with the lemon zest and vanilla. Scrape down the sides of the bowl as needed, and whip on high speed until the frosting is smooth, creamy, and fluffy. Again, patience is key, so give it time and you will be rewarded! To assemble, level off the tops of your cake layers by slicing off any domed humps with a serrated knife. Once flat, place one layer on your serving plate or pedestal of choice. 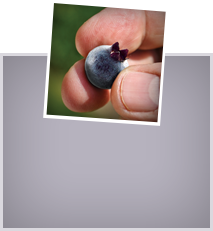 Evenly smooth the cooked Wild Blueberry compote all over, leaving about 1 cm of cake uncovered around the borders. When you place the next layer on top, it will likely push some of the jammy filling outwards, so you want to prevent it from running over the sides. After the second layer is secured in place, apply your frosting liberally to the top, smearing it outwards and down the sides. Pipe decorative borders and garnish with additional Wild Blueberries, if desired.